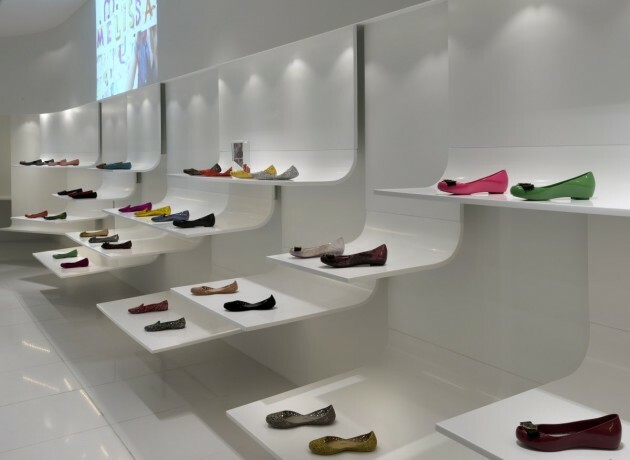 The Melissa brand, known internationally for their plastic fantastic shoes, chose Blu Water Studio to design their Malaysian flagship store. 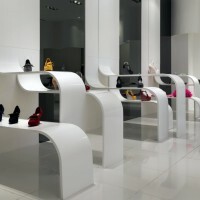 The design was inspired by the manipulation of a sheet of paper to create the look for the store. 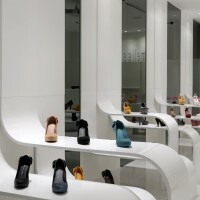 A singular M Dreams logo in darker colour adorns the entrance, giving the store a subtle signage for the brand. In order to achieve a mold to suit Melissa’s flexible shoes, Blu Water explored the shapes and outcome of compressing sheets and peeling layers. 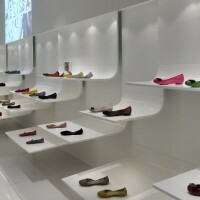 The peeling effect is apparent on the right side of the shop where, make-believe layers of sheets are peeled off the wall forming shelving for the display of the brand’s colourful product. 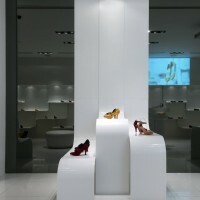 On the opposite side, giant fingers can be imagined pressing and pinching the floor and wall, fashioning ribbons out of them to create the rows of multi level cluster displays. 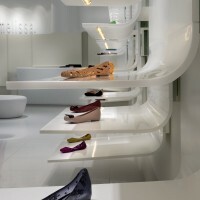 A curtain shape wall hangs from the ceiling that runs across the peeled off shelves to the cashier area feature projections that promotes Melissa’s ongoing campaigns. The overall whiteness is the one and only feature uniting Melissa stores all over the world.